Note: Do this experiment over the sink. 1. Take two bottles roughly the same shape of milk bottles. 2. Fill bottle 1 right up to the top with cold water. 3. Fill bottle 2 right up to the top with warm water and add some drops of food colouring. 4. Place the card square over the top of bottle 2, and keeping it in place with one hand, turn bottle 2 upside down, putting it exactly on top of bottle 1. 5. Now carefully remove the card, then keeping the bottle necks tightly together, turn both bottles the other way up – and vroom! 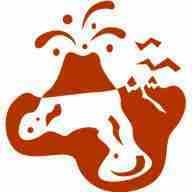 The reason you have created a volcano is because the cold water is heavier so it sinks, pushing the warm water up. Try the same experiment again, but this time fill bottle 1 with salty water and bottle 2 with cold water plus food colouring. Once again you have proved that salt water is heavier than plain water.